Philippe of Lorraine (1643 – 8 December 1702), known as the Chevalier de Lorraine, was a French nobleman and member of the House of Guise, cadet of the Ducal House of Lorraine. He was the renowned lover of Philippe de France, Monsieur, brother of Louis XIV. Philippe was the second son of the Count and Countess of Harcourt. His father, Henri of Lorraine, was created the Count of Harcourt in 1605, aged 4. Henri was also the Grand Squire of France, a prestigious charge of the royal stables, the transport of the king and his ceremonial entourage. He was known as Monsieur le Grand. His mother, Marguerite-Philippe du Cambout, was a member of the old House of Cambout, who traced their ancestry back to the Sovereign Dukes of Brittany (11th century–1547). 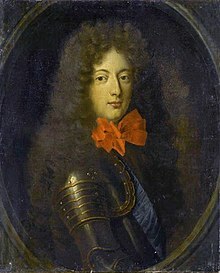 His oldest brother, Louis, was Count of Armagnac and husband of Catherine de Neufville, the youngest daughter of Nicolas de Neufville de Villeroy, governor of a young Louis XIV. She was a sister of François de Neufville de Villeroy, the future governor of Louis XV. Philippe was the titular Abbot of four abbeys: Saint-Père-en-Vallée in the Diocese of Chartres, Tiron, Saint-Benoît-sur-Loire and Saint-Jean-des-Vignes de Soissons. Known to be "as beautiful as an angel", Philippe became Monsieur's lover in 1658, while living at the Palais-Royal in Paris, where the young Princess Henriette Anne of England was living with her mother Queen Henriette Marie. The two Henriettes had fled England due to the English Civil War and had lived at the Palais-Royal as a grace and favour residence. Lorraine and Henriette would later live together under closer circumstances; Monsieur married Henriette Anne at the Palais-Royal in 1661. Monsieur openly flaunted his affairs at court, especially his long term lover Lorraine. In 1670, Henriette Anne died suddenly and mysteriously at Saint-Cloud, and it was suspected that Lorraine had poisoned her, even though the autopsy performed reported that Henrietta-Anne had died of peritonitis caused by a perforated ulcer. Philippe de Lorraine was three years younger than Philippe d'Orléans. Insinuating, brutal and devoid of scruple, he was the great love of Monsieur's life. He was also the worst enemy of the latter's two wives. As greedy as a vulture, this younger son of the French branch of the House of Lorraine had, by the end of the 1650s, hooked Monsieur like a harpooned whale. The young prince loved him with a passion that worried Madame Henrietta and the court bishop, Cosnac, but it was plain to the King that, thanks to the attractive face and sharp mind of the good-looking cavalier, he would have his way with his brother. Monsieur even told Henriette Anne that he could not love her without Lorraine's permission. Monsieur's first marriage was not a happy one. In January 1670, his wife prevailed upon the King to imprison the chevalier, first near Lyon, then in the Mediterranean island-fortress of the Château d'If, and finally he was banished to Rome. But by February, Monsieur's protests and pleas persuaded the King to restore him to his brother's entourage. In 1682, Lorraine was exiled again, having been accused of seducing the young Count of Vermandois (son of Louis XIV and Louise de La Vallière) with his set (including the Prince of Conti) and began practising le vice italien (the contemporary term for homosexuality). Having been allowed to return to court, he was then blamed for helping to instigate the marriage between Philippe d'Orléans, duc de Chartres and Mademoiselle de Blois in 1692. Chartres was the son of Monsieur and his second wife Elizabeth Charlotte of the Palatinate, who did not get on with Lorraine at all and merely "tolerated his existence". Monsieur and Elizabeth Charlotte married in 1671. According to Henriette Anne, Elizabeth Charlotte and Saint-Simon, Monsieur was frequently manipulated by Lorraine. Monsieur died in 1701; by the end of his own life, he had lost his collection of furniture at the Palais-Royal (much of which was from the Palatinate) and the money from the abbey, but he did reconcile with Elizabeth-Charlotte. Saint-Simon also said that he married his cousin Béatrice Hiéronyme de Lorraine (1662–1738), Abbess of Remiremont. Lorraine died in 1702, aged roughly 59, from a fit of apoplexy, having lain with women the night before. His niece, Marie de Lorraine, was the Princess of Monaco, as the wife of Antonio I.
Lorraine has descendants, including the old Counts of Oeynhausen and the Marquess of Alorna. ^ van de Pas, Leo. "Philippe de Lorraine, Le Chevalier de Lorraine". Genealogics .org. Retrieved 1 December 2009. ^ Monsieur le Grand was superior to the First Squire of France who was known as Monsieur le Premier and in charge of the petite écurie. From 1643 till 1790 the post of Grand Squire was held by Henri of Lorraine's oldest male line descendants. ^ Robinson, James. "The History of Gastric Surgery, chapter 20". The History of Gastroenterology. p. 239. ^ Van der Cruysse, Dirk (1988). Madame Palatine, princesse européenne (in French). Fayard. p. 165. ISBN 2-213-02200-3. Philippe de Lorraine était de trois ans le cadet de Philippe d'Orléans. Séduisant, brutal et dénué de scrupules, il fut le grand amour de la vie de Monsieur. Il fut aussi le pire ennemi des deux épouses de celui-ci... Rapace comme un vautour, ce cadet de la branche française de la maison de Lorraine avait mis dès la fin des années 1650 le grappin sur Monsieur comme on harponne une baleine. Le jeune prince l'aimait avec une fougue qui inquiétait Madame Henriette et Cosnac, mais qui fit comprendre au Roi que, grâce à la figure charmante et la tête bien organisée du joli chevalier, il aurait barre sur son frère. ^ van de Pas, Leo. "Claude de Souches". Genealogics .org. Retrieved 1 December 2009. This page was last edited on 4 March 2019, at 02:05 (UTC).